Will IIS on Windows XP support accessing website from remote machine? Normally we used to access php webpages on Apache from remote machine by entering the ip address. We have tried the samething with IIS also. But it seems IIS on XP is not supporting this option. 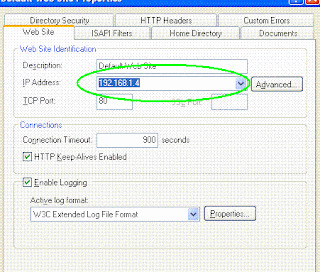 We tried to access ASP webpages from different machine within the LAN by entering the IP address. But it didn't work. Even the "Ip address and Domain name restriction" option is disabled in "Directory Security" tab. Refer the below screenshot. When I searched the internet forums, most of the people are saying that IIS on Windows XP won't support accessing website from remote machine within LAN. It seems only IIS on Windows Server will support this feature. But when I checked the websites tab I can see the option for entering IP address for the website. Refer the below screenshot. I am just wondering why IIS on XP should have an option for specifying IP Address when it is not supporting this feature(i-e accessing remote websites by giving ip address).